The Royal Shield of Scotland, having a demi-lion only, which is pierced through the mouth with an arrow. On Friday 9 September, the day originally agreed for battle on Millfield plain, the English army left its baggage at Barmoor and marched westwards towards the River Tweed and the crossing at Coldstream. By mid-morning the Scots, both the leaders and the common folk, were extremely uneasy. Their prepared positions were useless and the enemy was between them and home. Surrey’s reputation alone would have been enhancing the quality of the English army in Scots’ minds, and few would have considered that the English were placing themselves in similar peril, with their backs to the River Tweed and out of reach of resupply. To reach either Coldstream or the Scottish army, now hurrying to re-deploy north-facing on Branxton Hill, the English had to cross the River Till, no great feature, but still time-consuming and tiring in weather that was both cold and wet. Moreover Surrey had to divide the army into two divisions, since all could not use the only bridge without causing an unacceptable delay, and the artillery could only cross by a ford. Once across the Till, the army began to deploy in sight of the Scots, who were by now hastily regrouping on Branxton Hill and within cannon shot. The time was now three o’clock. Lord Admiral Howard’s division deployed on the hill south of Branxton village with Edmund Howard’s troops on the right, the Lord Admiral’s in the centre and those commanded by Sir Marmaduke Constable on his left. The Earl of Surrey’s division was still struggling forward through the mud with most of the cannon, but managed to take up a position on Marmaduke’s left before hostilities commenced. That the Scots did not intervene while the English were still in some disarray may be explained by the fact that they themselves were still sorting out their positions after having to re-deploy from Flodden. At four o’clock cannon fire commenced. It quickly became apparent that the Scots had neither had time to emplace their heavier guns well, nor had they the better gunners. Scottish shot from the higher ground of Branxton Hill was mostly flying over the heads of the English, while the lighter English artillery, mostly manned by experienced sailors, accurately disposed of the Scottish gun-crews one by one, while carving lanes through the stationary pikemen and light infantry. First to break under the bombardment were not infantry however but the irregular border horse commanded by Alexander Home, Earl of Home on the far left of the Scottish line. But far from fleeing the field they dashed forward, assailing the right of Edmund Howard’s force. The Highlanders led by Alexander Gordon, Earl of Huntly, armed with sword or axe and targe, but mostly lacking body armour, hastened after the horsemen and Howard’s men found themselves fighting for their lives. Many of the Cheshiremen on the extreme right tried to find safety in flight, which weakened the English right wing still more, but the situation was stabilised by a timely intervention of Thomas, Lord Dacre’s border horse, Surrey’s only available mobile reserve. Rather than withdrawing for a further attack, both Home’s and Huntly’s ill-disciplined men either headed for home or fell to looting the dead. Now the Scots made a fatal decision. Whether that decision was made by King James, by subordinate commanders, or by the soldiery seeing the apparent success of their comrades deciding simply to join in to avoid further slaughter by cannon fire, is unknown. But the Scottish centre now advanced down Branxton Hill towards the virtually unscathed English line. Had the going been good this might just have succeeded. But the low-lying ground between the two armies was boggy after the recent rain. Moreover the Scots were mostly equipped with 15 foot pikes, with which they had been supplied and trained by the French advisers only weeks before. In the hands of highly trained, highly disciplined, units such as the Swiss, pikes en masse could be killing machines. In the hands of the Scots, unused to the unwieldy pikes and to drilling together in large units, they were a tactical disaster, and a series of personal tragedies ensued as the English billmen first chopped the pikes into matchwood and then felled the men still holding the stumps or desperately reaching for the swords and axes at their belts. Seeing his main force floundering, King James made the heroic but suicidal decision to try to encourage his faltering army to superhuman efforts by fighting at their head. This was to be his Alexander the Great moment, leading his pike phalanxes to victory by his timely intervention. If that is what went through his head, or whether he saw that the alternative was inevitable capture or flight, we do not know. But into the fray he charged, and his commanders and much of the rest of the nobility felt it their duty to join him. Most of them did join him – in death at the hands of nameless English billmen waiting to drag them from their horses and finish them in the mud. While King James was fighting and dying in the forefront of the battle, Archibald Campbell, Earl of Argyll, and Matthew Stewart, Earl of Lennox, and the Highlanders of the right wing were under attack from flank and rear by the force commanded by Sir Edward Stanley, son of the Stanley who had made the difference by his inaction at Bosworth Field. The right wing of the Scottish army had already suffered from the artillery fire and then from a hail of arrows from the English longbow men. A new hail of arrows from an unexpected direction followed by a combined cavalry and infantry charge by troops better equipped and led than themselves dissolved the Highlanders before they could re-dress their ranks. As ever, those who could fled, those who could not died. Stanley was able to keep his men under control and plunge into the mêlée, thus sealing the fate of many more Scots, including literally hundreds of its nobles, clan chiefs and feudal lords. One of those slain was Adam Hepburn, Earl of Bothwell, commander of the Scottish reserve. But of the fate of the reserve, which included the French troops, history does not relate. Some of them may have joined their comrades in the valley. Most probably slipped away while they had the chance. That there were no French names amongst the list of fallen knights and gentlemen suggests that their commander and most of his officers, perhaps even the bulk of the contingent, escaped. Home’s and Huntly’s remaining men on the Scottish left, who had eventually regrouped after falling into disarray, might have attempted a counter-stroke, but Home was not prepared to lose any more of his borderers in a lost cause . His lands lay just across the Tweed and he was going to need every man to defend them. As night fell, the battle drew to a bloody close, with English troops dispatching many wounded Scots and tending to their own wounded comrades. At length most snatched some sleep amongst the dead. The following morning Lord Home’s much depleted border horse surveyed the scene from a distance but soon retired. The English were too tired and too disorganised to follow. But as the Earl of Surrey received the reports of his sons and the other commanders, it became clear that a shattering victory had been won. It was immediately apparent that many thousand Scots had fallen and that a large number of those were nobility and gentry. Most obvious were the abandoned Scottish guns, 17 of them, and the provisions and loot which were quickly seized upon by the hungry troops. As the day progressed and the bodies were searched, the mutilated body of King James was discovered, and by the end of the day the bodies of one Archbishop, two Bishops, two Abbots, 14 Earls, more than a score of Barons and over 300 knights and gentlemen had been identified, as well as the French Ambassador. Although instructed by the French in the ways of modern warfare, they had chosen to lead their men from the front in the old style and had paid the penalty. But so had their men, perhaps 10,000 of whom lay dead, while not a tenth of that number of English had perished and not a single commander .The Earl of Surrey was the hero of the hour, though King Henry VIII may privately have been very disappointed that his foray into France had resulted in no history-making exploits whereas his aged former adversary had removed at a stroke all effective Scottish military leadership, crippled its political leadership and ensured that the northern border was secure for a generation. 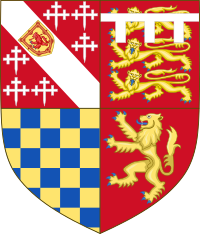 It took Henry several months to decide how best to proceed, but eventually on 1 February 1514 he elevated Surrey to the Dukedom of Norfolk that his father had had and which had died with him at Bosworth, and made Sir Thomas Howard Earl of Surrey. Many thanks for this Chris. I'm sorry nt to have replied earlier but I did follow your post elsewhere.